First things first, I need to take care of a little business. You might have already seen this on one of my other sites, but I’ve got three significantly different audiences across all three and, y’know, I really need to let all of them know. After all, it’s a good book. You should read it. After you’ve checked out the little advertisement and clicked through to buy your copy, join me below the horizontal rules, and I’ll tell you a little bit about the writing process. Man, that’s exciting. You could probably tell from my opening paragraphs, but the sales process really isn’t my thing. I wasn’t born to hawk my wares, digital or otherwise. That said, I was born to write exciting stories. I’ve told the story behind several of my stories here, including the story about Gods Tomorrow falling fully-formed into my life. I had a couple months at most to dream up an entire novel, and that novel became the birth of my professional career as a writer. I haven’t told the story about the sequels, though. As you know, I wrote Gods Tomorrow during NaNoWriMo. Thanksgiving always make a big ol’ roadblock right there at the end of November, but this time I was cruising into it. I’d developed this incredible world, I’d finally figured out who my killer was (although my protagonist was still completely in the dark), and I got Trish to agree to drive the long road to Little Rock so I could spend the time scribbling on chapter 13. I was doing just that, somewhere outside Fort Smith, and all of a sudden I stopped. I picked up my pen and turned to look out the window. And then, for the first time, I really started thinking about the end. Not the climax. I’d been thinking about the climax ever since chapter 2, and in chapter 13 I was standing on its doorstep, but I hadn’t really thought about what would happen next. Now, I pressed my head back against the seat with my mind racing. “Oh yeah?” Trish asked, not really paying attention. I had some clue how one would go about writing and pitching a TV series, but it involved moving to Los Angeles somewhere early in the process and I wasn’t interested. The more I thought about it, though, the more right that felt. Gods Tomorrow was like the pilot, the special 2-hour miniseries event, and Ghost Targets would be the series that came out of it — Katie Pratt and the Ghost Targets team pursuing the mysteries revealed in Gods Tomorrow but, at the same time, handling regular cases, week-to-week, and in the process bumping up against all manner of crazy and clever criminals. I couldn’t shake the idea, and within a couple weeks I decided I just had to go ahead and write the series that way. 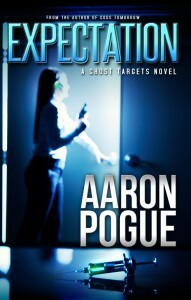 Ghost Targets: Expectation starts a few weeks after the end of Gods Tomorrow and opens with Katie coming back to work and receiving her next case. It’s the first regular “episode” in the long-running series. And it is long-running series. Before the end of that first December, I had the rough shape of it sketched out: 5 “seasons,” each united by a single overarching themes but featuring 5 “episodes” (the actual novels) that progress the season and series plot, but also individually introduce and resolve their own story plots. That’s 25 books, and in the two years since I’ve told a few people about my grand plans — and maybe I’ve grinned like a lunatic at their astonished reactions, but I’ve never given up on it. In fact, I’ve been working on the outline, and I’ve got pretty solid plans for all 25 now, and definite plots for at least half of them. As of last November, four of them are now done. And today, the series becomes a reality. You can pick up Ghost Targets: Expectation at e-retailers everywhere (look at my commercial above for the full list of links). It even features a teaser for episode three, Restraint, which should be available in August. That’s slow for a TV show, but it’s pretty impressive for a novel series. Come back Thursday and I’ll talk about the process — about how we’re publishing the Ghost Targets books and all the rest. For now, help yourself to a second dose of Katie Pratt. This was written by Aaron Pogue. Posted on Tuesday, February 15, 2011, at 6:10 am. Filed under For Fun. Tagged Aaron Pogue, Consortium Books, Creative Writing, Ghost Targets: Expectation, Gods Tomorrow, NaNoWriMo, Platform and Promotion, Publication, Storytelling, Trish Pogue. Bookmark the permalink. Follow comments here with the RSS feed. Both comments and trackbacks are currently closed. As one of your foremost readers and biggest fans, I can testify that the second dose of Katie Pratt is well worth the read and tastes even better than the first! Congratulations, Aaron! Yep, me too. This just confirms what I was thinking when I was reading. In fact, it feels a little bit like X Files. I hope you don’t mind me saying that, Aaron. But yeah, you should be able get 5,000+ pages from this world, fairly easily. I’d love to see you take on an epic “episode,” something on the scale of Weber’s “Honor Harrington” pieces, or any of Peter Hamilton’s epics. In other news, I’m back at another round of blogging!